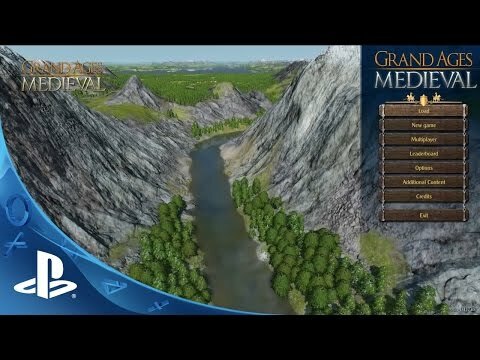 Grand Ages: Medieval is a real-time grand strategy game which immerses players in a truly massive game-world spanning over 20 million square kilometres all recreated in stunning 1080p high definition. As well as an epic single player campaign where players get to lead their people through decades of politics, trade, warfare and research, there will be an exciting 8-player multiplayer mode for rival rulers to fully embrace their empiric tendencies. It is the year 1050 AD. At the beginning of the High Middle Ages development in Europe has seen an unprecedented level of progress as a rapidly growing population spreads across the length and breadth of the continent. New frontiers are being explored, settlements founded and vast trading routes established. As the head of one of these small settlements, it falls upon you to lead your people towards greatness. Explore a vast world, gather resources, encounter other societies and use your trading expertise to expand and make your fortune. Found new cities, progress your nation with inventive technology and protect your trade routes against barbarian attacks until you are powerful enough to begin your conquest over Europe and forge a bold new empire. Grand Ages: Medieval is a real-time strategy game from Gaming Minds. Lead your people and advance through the decades by utilizing construction, research, expansion and conquest in an area extending from Scandinavia and North Africa; to Portugal, the Caucasus and the Middle East. Rise from the humble role of a simple mayor governing a small settlement to rule over all of Europe. Experience an exciting campaign with elaborately designed cut-scenes, play by your own rules in free play or test your skills in multiplayer against up to 8 players!